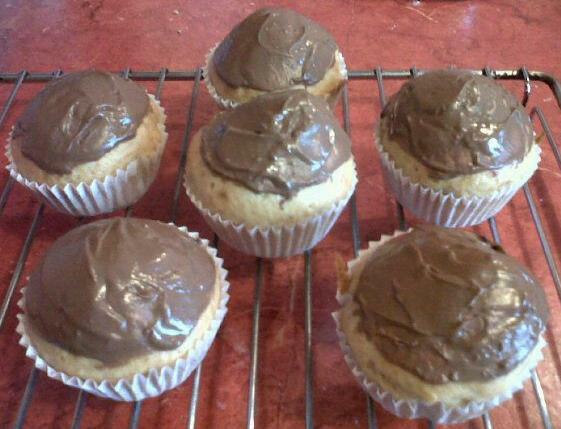 Banana peanut butter cupcakes topped with chocolate. Delicious! Mash the banana and mix well with the peanut butter, vanilla essence, egg and milk. Add the flour and sugar and mix well so that the cake batter is light and fluffy. Spoon into six cupcake cases and bake for 25-30 minutes, or until cooked through and golden. Remove from the oven and immediately place three chocolate buttons on top of each cupcake so that the chocolate melts, then spread it over the top of the cupcakes. These values are based on the products I used (Asda reduced fat peanut butter; Asda Smart Price eggs and flour; Asda chocolate buttons), so if you use different brands, the values may differ slightly, but as a rough guideline, this will give you an idea. These only have a very slightly peanut buttery taste, but the banana wasn’t so overpowering as to completely cover it – it was a very tasty combination. There was just enough chocolate on top to make it feel indulgent but without it being too much. Xander certainly enjoyed his! We had a lovely time making them together too! Dice the onion as finely as you can, and grate the cheese on the finest grate setting. Lightly beat the egg and milk together, then add the onion, sweetcorn, cheese, herbs and flour, and mix well. Spoon into four cupcake cases. Bake for 25-30 minutes, or until cooked through and golden on top. These values are based on the products I used – Asda Smart Price flour and Asda Mature Scottish Cheddar (the rest are generic) – please remember to adjust the values according to the products you use – these are only a basic indication. I think a touch of broccoli and/or carrot might work well. I also like using courgette in recipes like this, so I might try adding some of those next time. If you like extra cheesy, use an extra mature cheddar and perhaps a touch of parmesan, but remember to adjust your values! These turned out fluffy and light and just the right size to pop in a lunch box. 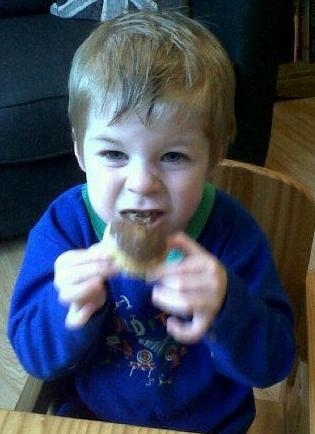 Xan’s not keen on sweetcorn, but he only picked out a couple of pieces that he spotted in his muffin and ate the rest no bother. I’ll definitely be making these, and variations on this recipe, again – sometimes it’s nice to have a savoury snack instead of something sweet and these just hit the spot! I love the summer – not because of the sunny weather, but because of all the summer berries that come into season! (I’m not a warm weather person – I think I was supposed to be born in the Arctic Circle, but the stork missed his mark and dropped me in the UK instead!). Lightly whisk the egg white, and add the oil, milk and vanilla. Add the raspberries to the mixture and break them up to make the mixture go pink (you can add a few drops of pink food colouring if you wish). Add the flour and sugar and mix well. The mixture will be very sloppy. Divide into four cupcake cases and bake for 25-30 minutes until a skewer inserted into the centre comes out clean. Cool on a wire rack, then enjoy with a glass of milk or a cup of iced tea! Values are based on the products I used – they may vary slightly from brand to brand. As you can see, it’s a very simple recipe, and you could easily swap out the raspberries for other soft fruit – blueberries or blackberries, or even cherries might be nice, but remember to change your nutritional values to correct them. I have to say, I’m very pleased with how these turned out. They weren’t particularly pink, but then I didn’t use any food colouring in mine – if you want your cupcakes more rosy, you can add a little extra colour if you wish. These are very light little cupcakes and have a pleasantly fruity flavour which is complemented by the vanilla, but neither overpowers the other. The verdict from my 3-year-old son is that they are yummy, so I’m happy with that! If you try this recipe, or a variation on it, please do let me know what you think of it! Continuing with my baking for Xan’s party (which is today) here are the last yummies I put together to take along for everyone to enjoy. First off, I thought I’d cater specifically for the vegetarians (my sister is a demi-veg and is going to be there today) and thought I’d offer an alternative to the sausage rolls we’ll no doubt be having. My vegetarian (not vegan, I’m afraid) version is cheese and tomato rolls. I’m afraid I didn’t make my own puff pastry. Rather than leave it to chance, I bought some ready-made stuff (also, I was fast running out of time, so I really needed to go down the route of convenience here! ), rolled it out and trimmed off the edges so they were nice and straight and even. Then I painted on a load of tomato puree, grated some cheese on top of that, and finally sprinkled on some mixed herbs. Then all I had to do was roll them up, cut them up and bake them in the oven till they were crisp and golden. Delish! Then it was the turn of the brownies! I’ve only made these once before, so it was a bit of a risk, but they turned out so good last time I just had to try it again. They certainly look good and while I was cutting them into little bite-sized squares, I tried a little crumb that fell off and it tasted gorgeous, so I’m hopeful these will go down well. I’ve left them in the trays for easy transport so I hope they come out easily and don’t fall apart! Last, but not least, I made some flapjacks. Chocolate chip flapjacks. Except I mucked them up a little bit. See, you have to melt the syrup, butter and sugar then stir in the oats, and I didn’t leave them to cool long enough before stirring in the chocolate chips so they got sort of, well, melty. Still, judging by the bit I licked off the spoon after smooshing the mixture into the trays, they should still taste pretty good (at least, I hope they will!). They’re all cut into squares, ready to pop out of the trays, so here’s hoping they hold together rather than crumbling – I guess we’ll see when we get them out at the party! I’m a busy Mum whose son turned three recently and is having a birthday party on Sunday and I enjoy baking. You’d think this was a great mix, especially when I get inspired by lovely things I see online. Like cake pops. Little balls of cake on sticks, coated in chocolate and then decorated with all manner of things. Every time I see a blog post about these little morsels, they look so simple and everyone extolls how easy they are to make. Stupidly, I took them at their word. And that’s how The Great Cake Pop Disaster came to pass. Bake a cake. Just a plain Victoria sponge cake. Easy. Break up the cake into chunks while young son looks on with horrified expression on his face at the seemingly wanton destruction of perfectly good cake. So far, so good. Open a large jar of Nutella. Oh, Nutella, you gorgeous jar of choco-nutty deliciousness, you! Add very generous dollop of Nutella to the cake crumbs and mix well till it all start sticking together nicely. Roll into chocolatey-cakey balls and try not to start singing Chef’s Song out loud in front of son who is too young to know about South Park. Poke little holes in chocolate balls (you’re still humming Chef’s Song, aren’t you?) with a lollipop stick and melt the chocolate. Dip the ends of the lollipop sticks in the melted chocolate and then stick them in the chocolate balls (yup, still humming that tune!) and pop them all in the fridge so the chocolate will anchor the sticks in place. Look on in dismay as a drop of water gets into the chocolate and ruins the whole lot of it – all four bars. Kick yourself as you dump the irredeemable mess in the bin. Melt another lot of chocolate – one bar at a time just to be sure you don’t waste four bars like last time – and dip your first cake pop in. Try not to swear as it breaks and falls off the stick into the chocolate. Try not to swear again as each and every one of the cake pops comes off its stick in the chocolate. Sacrifice your pastry brush in the hopes that brushing the chocolate on instead of dipping the cake pops in will make a difference. Fail in the trying-not-to-swear stakes as you realise you’ve ruined your pastry brush and the cake pops are STILL all coming off their sticks. Carry on painting the chocolate onto the cake pops and pulling out the sticks to drop them in the rainbow-hued sugar strands. Panic when you realise you’ve run out of sugar strands and still have half your cake pops to cover. Dig around in the baking cupboard and actually cheer when you find a bag of desiccated coconut and use that for the rest of them. Pop them all in the fridge to set and give the broken ones to hubby and child to polish off. Decide you’re never making cake pops again as they’re just too much hassle. Finally clean up the mess that is covering the entire kitchen. I really hope the kids at the party appreciate the damned things. We’ve decided to call them truffles. There’s nothing quite like the smell of freshly baked bread wafting from your kitchen, and with bread-making machines available at more and more reasonable prices, it’s never been easier to make bread at home. But what if you don’t have a machine? What if you simply don’t have room for one in your small kitchen, or you fear you wouldn’t use it regularly and it would be a waste of money? Well, you can still make bread the old-fashioned way – by hand. And it’s easier than you might expect! Mix together the strong bread flour and salt, rub in the butter, then stir in the yeast. Stir in the water and mix to a soft dough by hand. Turn out onto a well-floured surface and knead for 10 minutes by hand (or 5 minutes in an electric mixer with a bread hook) till the dough is smooth and elastic. Shape the dough and place in a greased 2lb bread tin or on a greased baking tray. Cover with a clean, wet cloth and leave in a warm place to rise for 1.5 – 2 hours. Immediately turn out onto a wire rack to cool. Wrap in greaseproof paper when cool and store in the breadbox. It will be fine in there for several days, but I guarantee it won’t last that long! Experiment with different types of flour – wholemeal, brown and white – or even try mixing half and half of two different types to see what works best for you. Different brands will give different results, as will different types. 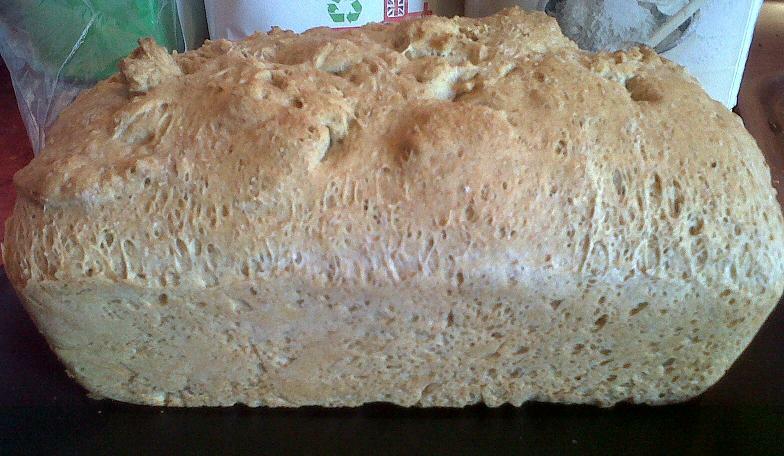 I find wholemeal gives a denser bread, whereas white tends to rise a little better and results in a “lighter” loaf. To get the best of both worlds, I like to mix a little wholemeal flour in with the white. It tastes gorgeous! Xan can’t get enough of my homemade bread, which is great because I really enjoy making it. It’s definitely worth the time it takes, although to be fair, it doesn’t take much dedicated time really, as the initial prep only takes about 10-15 minutes and the rest of the time you leave the dough to do its own thing and then pop it in the oven. Easy! Foodie Fridays is a weekly meme hosted by Diary of a Domestic Goddess. The aim is to share a recipe or a favourite food each week so that everyone else can try it. If you take part, please leave a link in the comments! Last week I was far too busy for any blogging at all, so to make up for it, I thought I’d give you all another of my favourite soup recipes. Seeing as how the weather here has been as far from the expected for summer as possible, soup seems to be particularly appropriate to warm us all up again while the rain pours down outside! This recipe will serve four people as a starter, or will do two or three very generous servings as a meal in itself. It’s a delicious, silky-smooth soup with a hint of sweetness and spice that will delight your taste buds and even kids who won’t eat their veg will enjoy it. It’s also really cheap to make, especially if you generally have squash and sweet potato in your kitchen – you don’t have to buy in anything special for this one! Finely slice the shallots and mince the garlic, then lightly saute in a little oil in a large pan. Peel and roughly dice the sweet potato. Add butternut squash and sweet potato to the pan with the balsamic vinegar, ground mixed spice, stock cube and water. Simmer till vegetables are tender, then use a hand blender or food processor till soup is smooth, adding more water if required to reach desired consistency. Season to taste with salt and pepper, and serve with crusty bread and / or croutons. For added indulgence, serve with a dollop of creme fraiche and garnish with a sprig of parsley. I tend to use a ham stockcube as I love that added depth of flavour, but it tastes just as good with a chicken or vegetable one. If preferred, you can leave out the balsamic vinegar – I just happen to love the stuff and always have it in my kitchen! For an extra kick, try adding a dash of Worcestershire or Tabasco sauce.